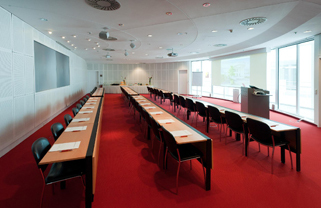 ESI Meetings Twelve conference rooms are available for workshops, seminars and meetings. 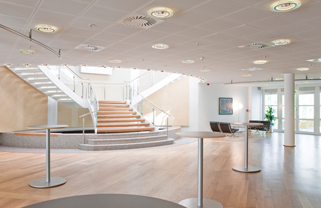 Whether a seminar, product launch, or customer meeting – the ESI welcomes you and your guests. 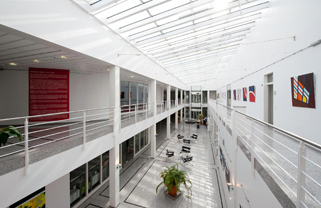 ESI Large Events Congress, symposium, company event – the European Surgical Institute (ESI) north of Hamburg has the appropriate framework. The Joseph Lister Auditorium seats 330 guests and fulfills event the most challenging functional and aesthetic requests. The spacious foyer in front of the auditorium is the ideal space for event-accompanying buffets, receptions, entertainment programs and exhibits. A terrace and winter garden are directly accessible from the lower level foyer and create an inviting atmosphere in which to welcome your guests. The ESI offers the most current conference technology for the smooth execution of your events, regardless of the technical complexity of your event concept. Our on-site media technicians are happy to help you with the implementation of individual audio-visual solutions. 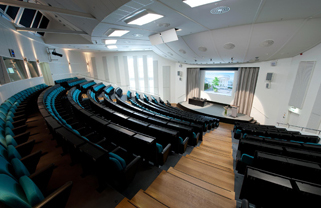 The Joseph Lister Auditorium is fully air-conditioned, includes a black-out option and is equipped with wireless internet. Modern communication technology enables live-transmissions from around the world and interactive broadcasting. Along with professional meeting technology such as overhead projectors, screens and flipcharts, the auditorium includes discussion equipment, interpretor booths, a TED voting system as well as a stage. Along with the perfect location, the ESI offers a professional event management team. Benefit from the competence and charming composure of our organization from the planning stage through the review process. For further information, please contact ESI EVENT - Excellence, Service, Innovation!